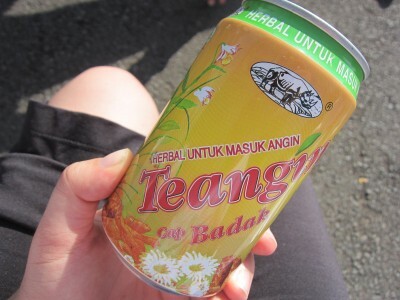 Here in Southeast Asia there is a sickness named “Masuk Angin”, literally translated “Enter Wind”. Many people have different understandings of it, but the basic principle is that wind enters the body and causes what we might refer to as gas or a cold. One can get Masuk Angin a variety of ways including riding a motorbike without a jacket on, sitting on a cold tile floor, or having a fan blow directly on you. The remedy for Masuk Angin is to have someone take a coin and harshly scrape your back until blood bubbles just below the surface of the skin so that the air can exit the body. They also have an herbal drink that is supposed to help rid of the air (it doesn’t taste too good, they gave it to us after a race once). When I first heard about this I thought for sure it was an urban legend, but it rings true for people who live here. To Westerners it sounds bizzare, and most Westerners here agree that while the sickness itself is real, the manner in which we get it may not quite be wind entering the body. I have learned that when living cross culturally, questioning assumptions can be healthy but blatantly pointing out what we think is wrong about another’s culture makes no progress. This morning after devotions with the University students I live with I mentioned that my stomach was a little uneasy. “Oh!” they cried, “Masuk Angin!” I generally avert this kind of situation by saying Westerners can’t get Masuk Angin, and despite their possible suspicion, the conversation is left at that. Today, however, my students were inquisitive. “What?” they said, “You’ve never had Masuk Angin? ?” I smiled. I knew I was in a trap. How could I inoffensively tell them that I didn’t believe in this illness? One of the other Westerners who live in this house chucked in the corner. He knew I was in a trap too. I gently explained that I had never had Masuk Angin. They asked my other Western friend and he too claimed he had never had Masuk Angin. Shock overwhelmed their faces. They’ve seen a lot of strange things from us Westerners before: peanutbutter and bananas, carrot juice, sugarless coffee, but this was a new one. We cautiously explained that we believe gas comes from perhaps something we ate. We continued in saying that we sleep with fans blowing directly on our faces every single night, and that we often have no qualms about sitting on a cold tile floor. They smiled. We smiled. In other news, tonight I was explaining that I don’t drink coffee at night because the caffeine keeps me from sleeping (they don’t have decaf here), and they said, “Masashi!” which means, “I don’t believe that!”. Just another day living life across cultures.